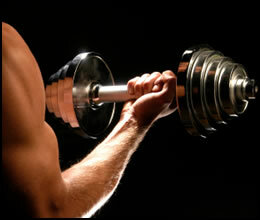 Weight lifting dumbbells are highly useful, and very basic equipment. Check out Part 1 to get some info on routines and guidelines for lifting. Here, we'll be looking at lifting variations to try, concerns to address, where to buy your dumbbells, and how to develop the muscular strength and power you want. Don't just work your chest, abs, and biceps. They do look beautiful to show off, to ladies and in the mirror, but those definitely aren't the only the muscles you have. Work your back, your legs, and your hamstrings. They aren't as showy as ripped abs, but they are excellent for real strength and whole body power generation. Also, you'll keep from hurting yourself with overdeveloped muscles on one side of a joint and weaker muscles on the other side. That sort of imbalance in development, and subsequent injury, is just disgraceful. And pull as well as push in your workouts. To balance your bench presses and shoulder presses, do rows and weighted chin-ups. Make both actions strong because, hey, you do both actions in real life. Also, eat the right weight lifting foods. You don't need to be neurotic about counting calories, but a good place to start is eating (1) real food, (2) keeping lots of lean meats in you diet for protein, and (3) not drinking carbonated-sugar-crap-beverages. You can get dumbbells many places, but the first place you should not look is in a magazine or a store online. You can do better than that. Check out www.craigslist.org for people in your area getting rid of dumbbells - there's normally someone getting rid of a weight set. Next try eBay and look for local people, since shipping will quickly make used dumbbells as expensive as new ones. Other than that, just look around. Check the newspaper to see if people are getting rid of them locally, and keep your eyes open. The Rotary club near me has an annual rummage sale with tons of junk, along with dumbbells and other weights. There are tons of ways to get cheap dumbbells if you don't want to go to a gym to workout. What Kind of Muscles Do You Want? Routines like the ones I gave in part one are good to start with, but they aren't the be all and end all. You should examine what you want from your training and tailor your workouts accordingly. This page explains the benefits of different kinds of weight training sets and reps, and how they can give you more strength, a more sculpted physique, or more endurance. Don't underestimate doing hypertrophy training (specific training to get bigger muscles). Focusing on pure strength is good in the beginning, but it can really keep up your motivation to get that direct, visual reminder that you're lifting - and getting darn good at it, too. And finally, when you're weight lifting dumbbells integrate in some explosive movements. Rather than lifting the weight slowly, once you have enough control practice lifting the weight speedily and forcefully - develop your power! • Click here to leave 'Weight Lifting Dumbbells - Part 2' & go back to the Home-page! 1. Dos Remedios, Robert. 2007. Men's Health Power Training: Build Bigger, Stronger Muscles Through Performance Based Conditioning. Emmaus, Pa: Rodale. Pp. 12.